Have you been lacking that extra space in your kitchen that you so desperately need? Maybe you need more counter space to spread out and work when you are preparing dinner each night. Or, perhaps you’d really like to get your cooktop over to a new area so that your space has a better flow for all of the busy traffic that your family brings to the kitchen on a daily basis. What better way to add both beauty and function to this popular room than by adding an island with custom stone countertops?! The addition of this simple yet versatile piece will give you the extra surface area that you need to cook, to unload groceries, to set up camp when it’s homework time, and for any other purpose that you find yourself lacking the capacity for in your current kitchen setup. And, this island can really be brought to the next level by the addition of custom stone! Moreno Granite and Marble specializes in bringing a look of luxury and practicality to kitchens all across the DFW area. We know that this room is the central hub of every home, and that you want to fully enjoy this space in which you spend so much time and welcome so many guests into day after day. By adding natural stone counters, you are ensuring that your surface is trendy and classy while remaining a durable surface to work on and keep clean for years and years to come. Granite, for example, is a very non-porous surface that is easily cleaned without having to use harsh chemicals, and it stands up well to extreme temperatures without signs of wear. You can pull your pans right out of the oven and place them on the island top without a second thought. If you are ready to get started in your next home renovation project by adding that island that you so desperately want and need, then give us a call at Moreno so that one of our project managers can walk you through the steps of selecting the perfect stone slab for your new space. 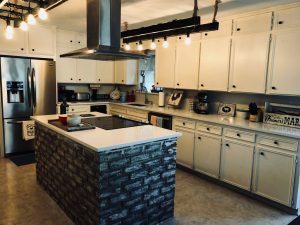 Some of our customers add a separate island that is set apart and differentiated from the rest of the kitchen, whereas most people go ahead and add new stone counters to the whole kitchen while they are in the process of revamping. The choice is yours, and we are ready to take your beautiful home to the next level of elegance!